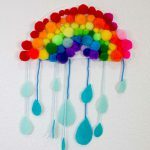 Rainy days and fun days will find kids fishing around for beads to make this colorful beaded rainbow fish. Bead crafts are a good way to help develop fine motor skills. Black sharpie marker or craft paint pen for drawing on center of eye. Step 1: Begin by folding your ribbon or cord in half. Using a half hitch, secure it to a key ring or lanyard hook as shown in the diagram. Step 2: Stiffen each end of the ribbon or cord with scotch tape. The ends should resemble the ends of a shoelace. This will make it easier to lace on the beads. Step 3: Using the pattern as a guide, lace and weave the beads onto the ribbon or cord as shown in the diagram on the printables page. Make sure that you pull the strands tight after completing each row. Step 4: Finish by tying off with a double knot. Some patterns may have two knots. 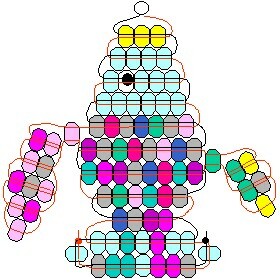 The knots are shown on each pattern as small circles. Trim off the excess ribbon or cord and secure the knot(s) with a drop of craft glue. 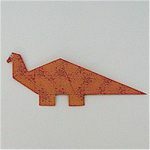 Evelyn McDermond became involved in making beadies and was inspired by her children into designing her own patterns. There are now over 200 patterns on her page for all to enjoy.